The member’s of my family, almost everyone of the people I have met working through the years, and most of you readers have something in common. Do you know what it is? You are ashamed of the name Jesus Christ. And a fair amount of the above claim to be Christians. You are more than willing to talk about vacationing, gossip, work, Hollywood and just about anything else you can think of. But when Mister Bill or anyone else for that matter so much as breaches the topic of Christ….Silence. The conversation ends and nothing will be said or added. You don’t want to speak of him and in your mind, this is a matter of religious privacy if you will. You will die in your sins and you will make hell your eternal home, just as if you were an axe murderer or any other hideous thing you can think of. In fact….to say you are his and to go to church and do nothing or say nothing in regards to Christian evangelism, is in actuality worse than never knowing about him at all. You are a disgrace. And now that I am in a happy place with you lets keep moving right along. Shall we? You say I am full of religious malarkey. Well, how about some scripture reading? After all, you love Jesus, don’t you? And since Jesus told us he is the living Word, you won’t mind reading Him a little bit, will you? You remember of course through all your biblical reading, while you spent day and night for 6 years getting your degrees, that the bible said the Word became flesh and dwelled among us. The Gospel of Saint Matthew chapter 5 verse 13…You are the salt of the earth. But if you being salt have lost your flavor, what then can be salted by you? This salt being you, is therefore good for nothing else, but to be cast out into the streets, and to be walked upon by the feet of men. Well then…that was rather succinct. How about another happy time scripture? An after-dinner mint if you will. Oh, you’re going to like this I am sure. Let’s read together in the book of Matthew chapter 10 starting in verse 32. This will only take a minute. Whoever, therefore, will speak of me before men, he also will I confess before my Father in heaven. But he also who will not speak of me before men, him also I will not speak of before my Father in heaven. Do not think that I have come to send peace on earth, but rather a sword. For a Christian man’s enemies will be those in his own household……It sounds a lot like you, my mouth zippered friends. Does it not? The philosopher Aristotle once said this. True friendship cannot endure simply by the love of one toward another. But rather by the two loving a third, and that being transcendent. And since I cannot bear to not defend the Catholic church from the constant darts of the Protestants. One of the things that Luther and Calvin wanted to dispose of, or so they thought, was the Catholics usage of Greek philosophy within its ranks, as well as in the educating of the priests. Fools were they and are those who say we have no need of this. Philosophy and psychology are at work every day of our lives. 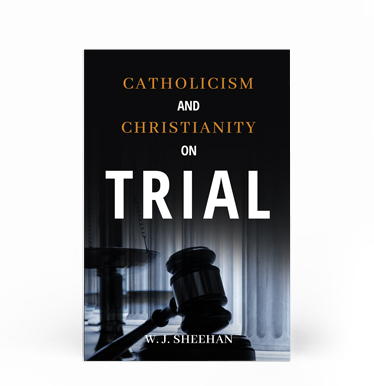 These two disciplines have tremendous value both in and out of the church, with the truth of the matter being who is using them and for what purposes. Certainly here we can see the wisdom of Aristotle. He says that people can’t know true friendship without knowing God. Now he may have been referring to Athena or Venus. But for our purposes, we know that without Christ our lives are lived in vain. And as for me and my house, a true friend is a blessed friend, a man or woman who I can lean on and be leaned on by. Someone who can and will give me guidance according to godly wisdom and prayerful life. James chapter 3 verse 17…But the wisdom that is from God is first pure, then peaceable and gentle, easy to be taken, full of mercy and it will bear good fruit. Without partiality and hypocrisy. And in Second Corinthians chapter 1 and verse 12 we read this. For our happiness is this, the testimony of a good conscience, and that in simplicity and godly sincerity, not with fleshly wisdom. And so my friends, your friendships and how they will work out in the long run, are based solely on where and how the friends in question are receiving their guidance and direction, which inevitably will be at use between the participants of the friendship. We see clearly in these two verses, that once again it’s us versus the world according to Gods plan for the church. There is no fraternizing and no cohabitating. It is simply those that are for God and those that are against. Without a good and substantial basis of one’s self in the Bible. You cannot and must not receive counsel from the world. For you will have nothing to weigh it against as far as its comprehensive value goes being used as a tool in your life as a Christian. The bottom line is this. If the council that you receive from a friend or anyone else is contrary to the word of God. Do not, do not, do not, receive it. The bible says clearly and succinctly that the wisdom of this world is the enemy of Him. Now back to philosophy and the foolishness of the Protestants. It is clear in this one statement alone by Aristotle. That there is great wisdom at work. Albeit perverted in that it is not directing the reader to Jesus. But to say that there is no value to the statement when applied to our faith is well…asinine to say the least. God has given me as part of my salvation the gift of discernment. Which is nothing more and nothing less than what I will call Godly intuition. The Holy Spirit is residing in me and in the hearts of every believer to guide us. To warn us and to protect us from the lies of the devil. When someone is lying to me or trying to misdirect me, I know it immediately. Not tomorrow and not next week, immediately! My brother-in-law just passed yesterday, and I was once again reminded of the frailty of this life. I was also reminded last night, in a poignant way, about the cross of Christ, recalling my first days in a Pentecostal church, and seeing nobody on the cross. As you know, I am a Catholic and I am once again appreciative of why seeing the body on the cross is a good reminder to us all. If our lives are to imitate Christs, and they are, then why don’t they? In earthly life, the vast majority of Christian people are striving for the same things which the world is. With some of those being, power, money, control, and self will, just to name a few. You may say that none of these apply to yourself and you would be a liar, but that’s a story for another day. Now, I ask you to fix your eyes on the cross which I have provided in the picture. On the cross, Jesus had no power at all, he was nailed to the wood unable to move or free himself from his captors. He had no money, and in fact, had told some of the early followers that he didn’t even have a place to lay down his head. His self will being absent, choosing rather complete obedience to the will of His Father in heaven. There is an individual whom I know. Not a friend but rather someone with who I must interact periodically. This particular person who says they were brought up Catholic, comes to me on occasion, spouting all kinds of rhetoric against the church and its treatment of women. Repeating continually false teachings from T.V. shows which she has watched, about new gospels, Mary Magdalene not being a prostitute, and all kinds of untruths presented by the media and Satan himself. At the root of all of this in her life and the lives of many others, is a failure to read Gods word, to pray often, and to follow and adhere to the teachings of his church. There are no rebels in heaven. The bible says that we being many are one body in Christ. There are not many bodies but rather one. The title of this blog is an interesting question indeed, and the truth be told, He was one of us. The scripture teaches us that Jesus came into the world not to judge it, but, that the world through Him might be saved. The key word being, “Might”. Jesus said, “I am the way, the truth, and the life. No man can come to the Father except he comes through me.” He also said, “If there was another way I would have told you.” So Jesus, not willing to fool or ensnare anyone in any way, thereby hindering their ability to understand and comprehend his message to mankind. rather succinctly spelled out what we had to do in order to inherit eternal life and the forgiveness of sins. There is no grey area as it pertains to his message. Repent, be baptized in his name, and believe in His life, death, and resurrection from the dead for the forgiveness of sins. There are many groups out there who claim that I am confused and that they have a better way than that which I have just set forth. They choose to ignore the virgin birth, the miracles witnessed by thousands, the resurrection of the dead in Jerusalem at the time of his crucifixion, Jesus being seen after his death by multitudes, the empty tomb, and His ascension into heaven in the eyes of hundreds of witnesses. And they do this at their own peril. 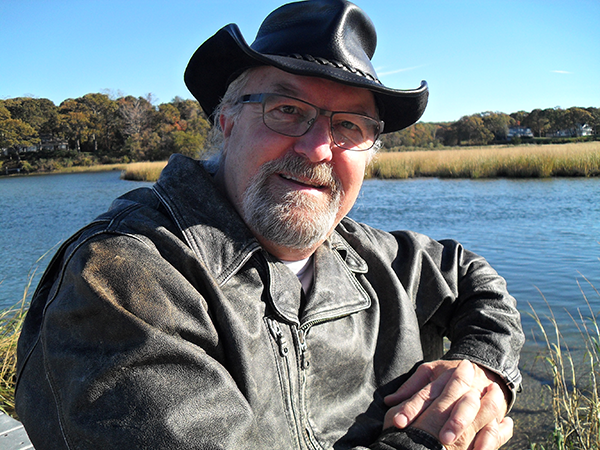 A certain ignorant man, who was interviewing me about my Bigfoot books several weeks ago, who grooms himself to appear like Captain Kangaroo in 2018, which in and of itself should tell you something about him. Went on a rant in the middle of my interview, an interview which I should have just hung up on, about the day which Christmas is celebrated on, and how in his mind it was a pagan holiday and the like. I said to him and I say to you, I don’t care what day Christmas is celebrated on. I am frankly just grateful that it is. And the truth be told, I celebrate my Saviors birth every day of the year. For those of you who are old enough to remember, during the somewhat formative days of space exploration by the United States and the Soviet Union. Nasa was perplexed by a most peculiar problem. The problem being an astronauts ability to write in space using a pen, which led to a million dollar investment in time and effort, in order to create a pen which could write no matter what the attitude of the spacecraft was in relation to the pen being held. This pen then became available to the public that was clamoring for any space-related stuff, as if we needed a pen that could write upside down, and they weren’t cheap either. The Russians, on the other hand, solved the same problem by simply using a pencil. Now you and I both know that many things come out of the science behind tackling complex problems, even if that problem is getting ink to the tip of a pen being held inverted. But I am not here to talk about pens and pencils, and neither are you. We are here, however, to get our lives right with God. 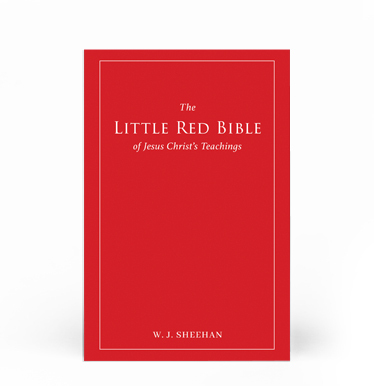 There are many in this day and age, who like to complicate things, thinking that they are Gods gift to humanity, having sat through a thousand sermons and read a hundred books on Christianity. But our faith is now and has always been a simple one. Believe in the Lord Jesus Christ and you will be saved. Repent and be baptized in the name of the Lord Jesus Christ. When many non-Catholics, look at a stained glass window, or some statues depicting saints which have gone on to receive thier eternal reward. They say that I as a Catholic am an idol worshipper. Nothing could be further than the truth. These things are no more of an idol to me than your 2018 Corvette is too you. The predominant use of such things in days gone by was that of being a talking point or an instructional tool for the ignorant masses. In other words, those who couldn’t read or write, in order to help them gain a better understanding of our faith and its history. Besides all of that, they are extremely beautiful and artistic. To be in the world but not of the world is what the scripture says that we should be. Yes, we are inevitably living in and working in the same world as is everyone else, but as Christians, we are called to be different. Which in and of itself then raises the question, are you affecting those around you or are they infecting you? We as Catholics should feel a check in our spirit when entering into certain conversations and situations, and if you don’t, its time for you to check on your spiritual state of affairs and quickly. We are called to be different and dramatically so, in fact, the scripture says that we are the light of the world. I remember seeing a picture of one of the early world’s fairs, where Thomas Edison had been contracted to illuminate it with his new AC powered lights. The world at this point in time was predominantly in darkness with the exception being candlelight and oil lamps. People flocked by the millions to both see and be bathed by this new found source of light. I want you to visualize the next person that you are speaking to, as being concealed by a black cloak, in other words, you cannot see them, you can only hear their words. As the conversation continues with this unseen entity, now ask yourself, is this conversation leading me closer to God or is it infecting my spirit in some way shape or form that will lead me away from God. We are called to have a positive effect on those around us, while at the same time being ever vigilant not to allow the world to infect us. The scripture says that our body is the temple of the Holy Spirit, which means that He is partaking in whatever you are partaking in be it visual or auditory. I have said it before and I will say it again, there are situations in life where the only reason Christ would have been there would be to save the lost. He is not entertained by what you consider to be entertainment. Your spirit is being tainted on a daily basis by this worlds affections and it needs to end. Salt is a spice, and it is used to enhance the flavor of food. We are said to be the salt of the world, and our lives are to enhance an otherwise tasteless society in which we live. The scripture says that God is light and in Him is no darkness whatsoever. In my life, there are many things which I do in order to better understand the enemy of my soul who is Satan. In other words, I want to be aware of the types of tricks and snares which he uses to dupe mankind. This would include at times watching some of the shows where they are encountering so-called spirits of the dead or ghosts. The scripture says plainly, that it is appointed unto man once to die and then the judgment. There is nothing that says you die and then wander aimlessly inhabiting the home or area in which you once lived or worked, having no apparent place to go and no direction. Knowing that God is light, an immediate and foreboding alarm should go off in your spirit, whenever and wherever you are encountering darkness of any form. That is, of course, providing you know and understand the scripture, which at this point you now do. The scripture also says that men preferred the darkness over the light because their deeds were evil. When the devil is at work, one of his main ploys is to dupe or mimic Gods creation, this is done in an effort to make you and others believe that there is something more to this life and existence of ours, other than what the scripture has laid out for us. And there are more than a few who play right along with that theme. 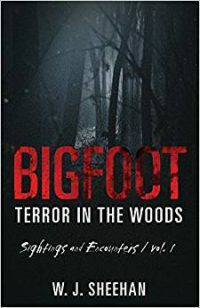 The existence of dark entities in homes, children’s voices being heard, things being hurled around the house by unknown and unseen beings, are all trademarks of the evil one’s activity. But of course, if you don’t believe the scripture, and you think that I am full of hot air, none of this matters to you. And you, in fact, are in for a rude awakening. When God had His hand on you, He extends to you the rope in various ways and forms. In the case of this individual, it was in the form of my blog. He voiced to me his concern about his own state of affairs and those of the world today. God is calling him and you, but will you respond? To be continued…. 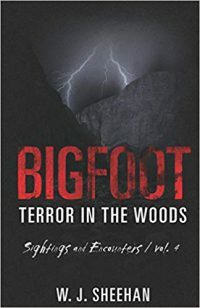 For those of you who may be unaware, I have spent the last year or more, working on a series of books, entitled, Bigfoot Terror in the Woods Sightings and Encounters. 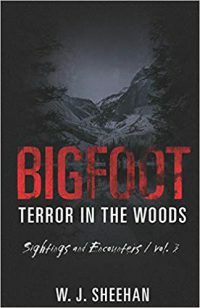 I recently engaged in my first interview about the books, with a wonderful man named Wes, who runs a podcast named Sasquatch Chronicles. My series is ongoing. 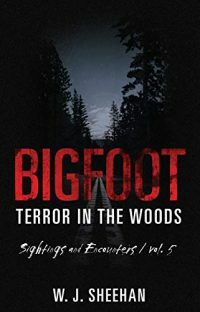 In the process of all that has been going on, I was speaking to someone very close to me, about one of the upcoming accounts in volume number 6, where a hunter encounters a priest under the most unusual of circumstances and finds himself praying the Lord’s prayer when his life is threatened. This person with whom I am close, who is, by the way, a Catholic man, said to me, that I shouldn’t include that in my interview. In other words, don’t bring God into the picture. When two people are married, the scripture says that the two become one flesh. You are no longer an individual, but rather, you have become part of your wife and she has become part of you, the two of you have become one body spiritually speaking. In like manner, when you enter into a relationship with Christ, He refers to you and I, as being his bride. In other words, He to has become one with you. How is it then that this man and others feel that they shouldn’t speak of their bride when living out their lives? Do you leave your bride in the car, while you go in to eat dinner? Of course not. Christ is my everything, it is he who created me, it is he who has given me the skills to write, and it is he with whom I speak every day of my life. In the context of the scriptures, the word satan means obstacle or adversary. When Jesus had revealed to the apostles, that he was to go to Jerusalem and die, Peter said to him without hesitation, that he must not do so. To which Christ said, get behind me Satan. Now, Jesus was not saying that Peter was, in fact, Satan, but rather he was identifying an immediate threat being posed to him finishing the work which the Father had sent him to do. In our own lives, we as Christians should be able to both identify and thwart the attacks which the enemy of our souls brings against us, but few are capable of doing so. The scripture also says that those who love this world will not see the kingdom of heaven. The bible teaches that if we draw ourselves nearer to God, then he, in turn, will draw nearer to us, but as you can plainly see, this requires first, a movement from ourselves. The enemy of your soul is quite happy with the current state of affairs in your life. Your lack of prayer and the need to be continually entertained by the things of this world are just fine with him. Because he knows that if you stay this course, he will own you in the end, and there will be no escape. First of all, as I begin this blog having been away from the site for the better part of a year. May I offer my apologies. 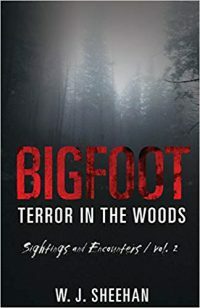 I have invested virtually the entire year writing a series of books on of all topics, Bigfoot. But now, I am back in the driver’s seat and ready to go, so let’s get started. I thought I would share with you something that had occurred in my life about a year ago, which re-opened my eyes in a profound way, to the plight of many church-going people. It was last October when I had approached a local pastor, about the availability of time in his parish, to speak on the subject of discipleship. After much discussion about the matter, the decision was made that he wanted to go ahead with it, saying also to me in the process, that surely God and the Holy Spirit is with you in this endeavour. So the plan was set in place for a date in November. Having asked this pastor about how much time would be allowed, he said to me that the previous guest had spent 2 hours speaking about a book on Angels, and so I had prepared myself for the allotment. During this time he had also asked for me to put something together in the form of an announcement regarding who I was and what I would be doing. Well, when the time came and the announcement had appeared, none of that which I had given him was printed, and yet, a huge section was dedicated to an Elvis impersonator that was going to appear. When the evening arrived, there were virtually 10 people there, most of which were invited by the pastor, who by the way said that he was going to try me out. Well, I did my due diligence, speaking for 90 minutes, and the evening ended. That was that. My question to all of you is this? How is it that a work that is begun in Christ needs to be approved by man? After the fact, he told me it was too long, and this after he had told me the previous speaker had spoken for 2 hours. It’s my understanding that the house was packed with drinkers and revellers for the Elvis impersonator, and ten people were present for the discipleship seminar. I was prepared, having done what God had asked me to do, and once again, the majority of the church had other things to do for the evening. And so, what are your personal priorities as it pertains to the things of God? When Jesus came to Lazarus’s house, he met up with his 2 sisters, Mary and Martha. Mary sat immediately at his feet, while Martha busied herself with the preparations. When Martha complained of her sister’s inactivity, Jesus said, Mary, has chosen the more important thing. They choose entertainment over prayer as a priority, and I do not. I have always said that you know who the foundation of your church is by those who show up for prayer, and not that everyone who is praying is always visible, but God knows who they are and that’s all that matters. The world has taken root in many churches and I will have none of it in my life. I want more of Christ and less of anything and everything else in my life. And to date, I still haven’t achieved anything worth bragging about in that regard. What are your priorities? To be continued…. Having given much thought to the idea of a personal biography for all to peruse...my heart was directed to none other than our churches greatest apostle...that being Paul..
And so in the light of God... and in the spirit of Paul... I will state the following.. I am a sinner saved by the grace of God...And what's your biography my dear reader.. as it pertains to your life in Christ? For everything in it outside of Him is as the deserts sand...blown to and fro by the winds of this world..